Okay, so there is no competition but for anyone out there looking for the ultimate in indulgence when it comes to steaks–look no further! Mike went all out with this meal and you can bet we were rubbing our food babies satisfaction at the end of dinner. The best part hands down was the bacon hollandaise smothered all over those perfectly cooked pieces of grade A Alberta beef! Another awesome addition was the eggplant salad courtesy made by Theo’s Greek Kouzina booth from the downtown farmer’s market. Well sir, I enjoy all the meals my man cooks and want to share his culinary prowess with the world! Plus, I know it makes some people say “yo baby! Why don’t you cook me all these fancy meals? hmmmm?” haha sorry significant others of the world. I’ve won the foodie lottery with Mike. So from what I remember of this meal: We had homemade whole wheat bread with mozzarella and some herbs melted on top. Mike cooked up some pork with grainy dijon mustard and some garden fresh onions. The gravy is the pork juices cooked up with some flour. To top it off there are some frites added for crunch. There you have it! Hot meat sandwich. This dish was quick and easy to put together in half an hour tops. Thank you Irvings Farm for making the Old English ‘Cumberland’ Sausage. With this great tasting sausage which contains NUTMEG! 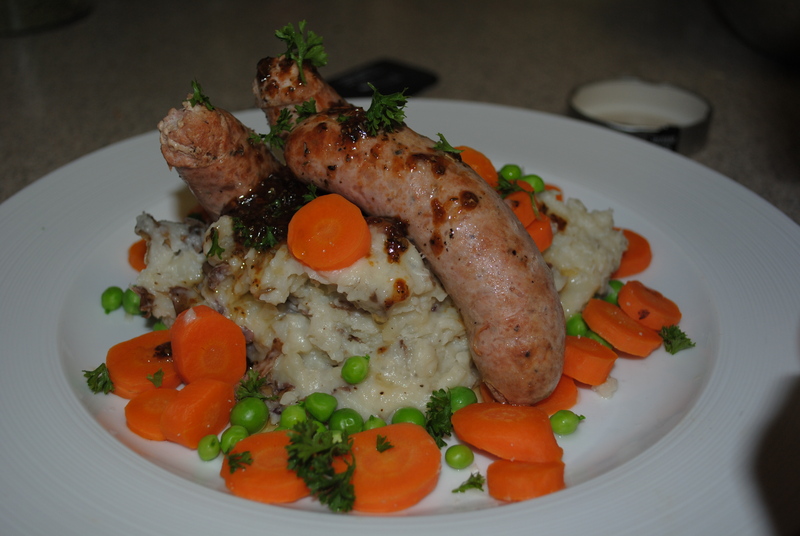 Mike put together a classic English dish known as Bangers and Mash. Pretty much you grab some potatoes, cook em’, mash em’ and thrown some butter and cream in there. 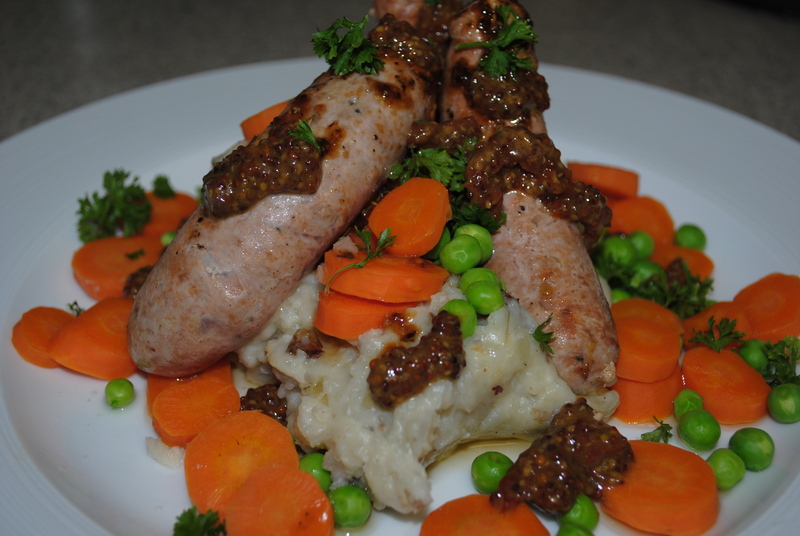 Then cook up some all around awesome sausage bought from your local butcher. Rifle through your fridge for some veggies and once everything is cooked toss it on a plate and call it a day. Mike also added grainy dijon mustard and some parsley to the plate. This is a great way to get rid of some leftover potatoes or vegetables. 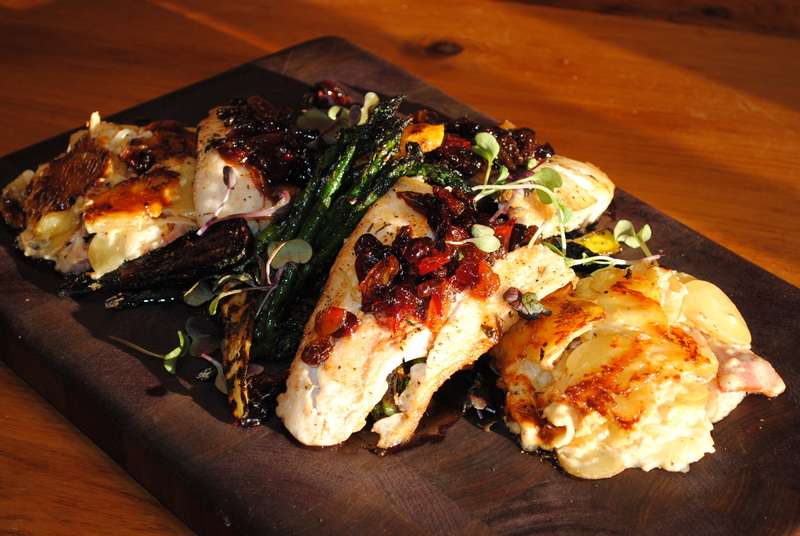 Check out this delish dish all created from farmer’s market finds! 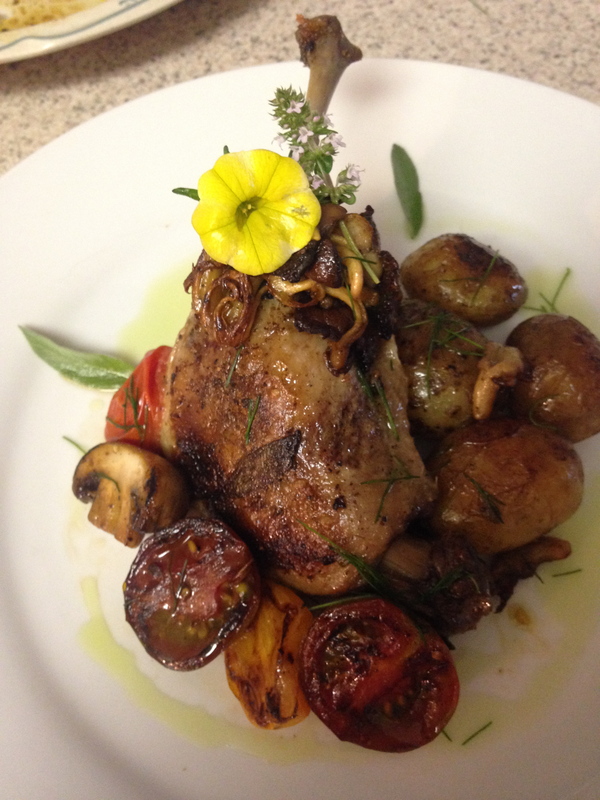 Duck leg on a bed of duck fat potatoes with braised tomatoes and a medley of mushrooms cooked in BUTTER! Topped the dish off with some cute flowers from our patio garden. This dish was made quite awhile ago so I’m doing some guess work as to what is all on the plate. Wow it has been awhile since the last post! Time to get back on the foodie train because we’ve got an engagement party coming up and there will be tons of good eats! Anyways, here we have charred swordfish on a bed of sauteed in butter and sugar cherries and some sweet saskatoons picked fresh for the dish. Garnishing the dish are some pickled lemon slices and microgreens. June 13-15, Porkapalooza came to Edmonton! I wish I could have gone. If I went I would have fan-girled so hard because Diva Q was there judging the competition and that woman knows her barbecue! With this in mind we had an epic dinner of ribs! Let me introduce you to our dinner: Pork side ribs braised in red wine, garlic, carrots, ketchup, hickory barbecue sauce, random dry spices baked for 4 hours at 275 degrees. 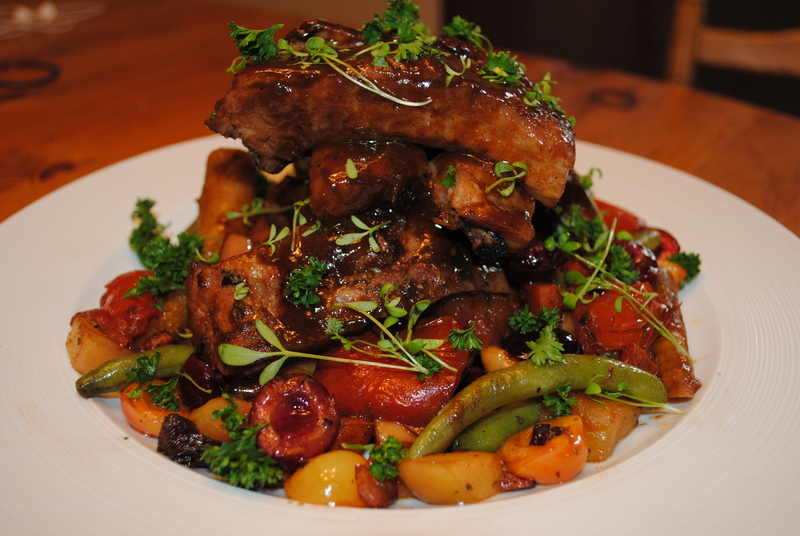 Underneath the ribs is a sauté’ of tomatoes, cherries, green & yellow beans and acorn squash. Even though squash is not yet in season here in Alberta, we froze some off from last year. We’ve come to appreciate having a little bit of Summer/Fall food in our dishes throughout the year. Especially in the winter. As a finishing touch we added cashews in with the vegetables and an apple vinegar which adds a great tart element to the dish. Microgreens and parsley add a splash of green. Bro, Do You Even Cook? In the words of the Croods movie: Dah dah daaaaahhhh! To understand my reference check out the video here. I invited a new friend and her man over for supper after their power went out. I am still amazed by how quickly Mike can pull together a quality dish in the span of a few hours. Yes, I am truly lucky to be dating a chef! This is the beginning of our summer farmer’s market dishes and I am so happy to have fresh produce available every weekend. This meal took approximately 2 hours to create. Pizza, Pizza! Eat all About it! This classic Italian thin crust pizza was hand rolled by my awesome man Mike! The dough is hand-pulled and baked off at a super high temperature making it super yummy and tasty. Mike says his secret to a great dough is he puts a ‘glob’ of honey in the dough. “I don’t measure sh**” was his response when I asked how much honey haha. After the dough it is all about the sauce. The sauce is made by slowly roasting tomatoes with basil and garlic. Blend all the ingredients together and simmer to perfection. Finish the sauce off with a bunch of fresh herbs and little more salt than you think you need. Your dough is not very salty and depending on the salt level of your cheese as well you need to compensate by adding more salt to enhance the flavour. If you have made a salty dough and are using a salty cheese such as a parmesan or pecorino (both hard cheese) the salt level will be fine without adding much more. For our pizza we used mozzarella and cheddar with a sprinkling of finely chopped fresh herbs on top. As a final touch, drizzle a nice olive over the pizza when you bring it out of the oven. Some fresh tomatoes on top also will make your pizza even more tasty. If you have seen the Lego Movie you will know to sing that first sentence. Anyways, we now have the ice cream make attachment for our kitchen aid mixer! 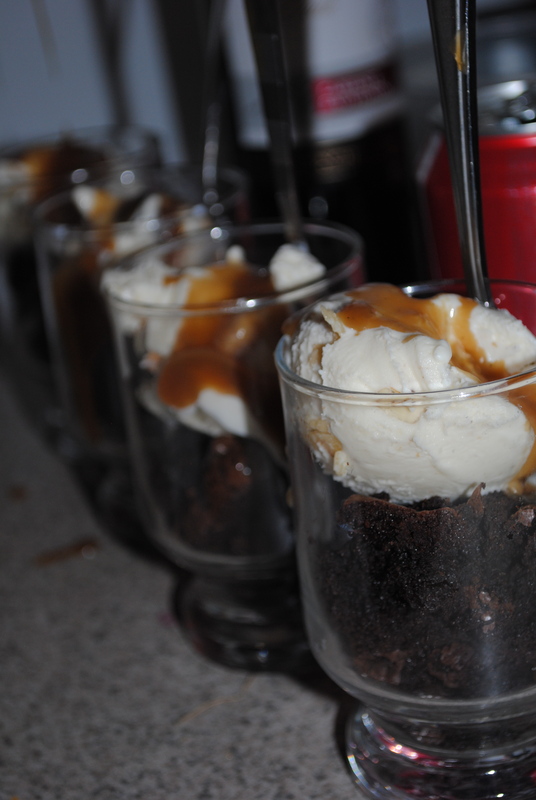 It is awesome and we have made a ton of flavours already! We have made: mint chocolate chip, vanilla bean, chunky strawberry and chocolate swirl! Ice cream for days!